A mysterious man by the name of Jack moves stealthily through the night, quietly killing an entire family. Or so he tries. As Jack made his way through the house, a baby boy made his way out of his crib, out the front door, and down the hill, where he stops at a graveyard. He is immediately taken in by the friendly people there, the first real boy to live in the graveyard among the ghosts. The boy is taken in by The Owens’, and comes to be known as Nobody Owens, Bod for short. He is taught lessons, assigned a guardian, and given the Freedom of the Graveyard, as the people there try to save Bod from the man who killed his family so long ago. This was my first Neil Gaiman book, and definitely won’t be my last. The Graveyard Book was a unique take on the classic, The Jungle Book, and was definitely a quick, fun book. Bod gets into all the scrapes and difficulties any boy would get into at 6, 10, 14 years old, and I loved seeing the outcomes as they unfolded. The illustrations at the beginnings of the chapters were great too, especially the first chapter with the knife. It set the tone for the book and what was to come, and made me want to keep reading right away. Gaiman filled the graveyard with so many stand out characters: the Owenses and Silas, Mrs. Lupescu and Liza all made the story that much richer and more vibrant. For a story taking place in a graveyard, it really just came to life with its characters and messages and lessons throughout. 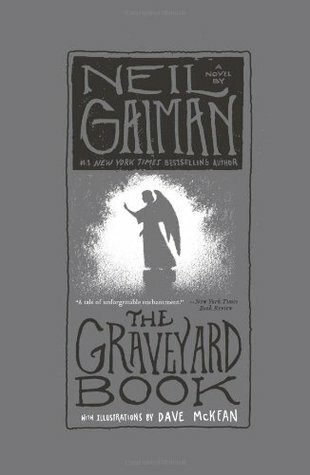 Whether you are a long time fan of Neil Gaiman or new like I was, I would recommend The Graveyard Book! Would this book be okay for an 11 year old boy? I think it would be! Bod only gets as old as 14, and is much younger than that through the majority of the book. The only thing is the killing in the beginning, but even that is so glossed over I don’t think it would be a problem! I enjoyed this book as well-Gaiman is such an amazing author! I love Gaiman, but somehow I haven’t read this one yet. To the TBR pile!